Following my recent Sat Bains review a colleague said they would love to experience that sort of food but would struggle to justify the cost. Whilst not available in Nottingham, a number of top restaurants offer great value lunch options at a (relative) bargain price. 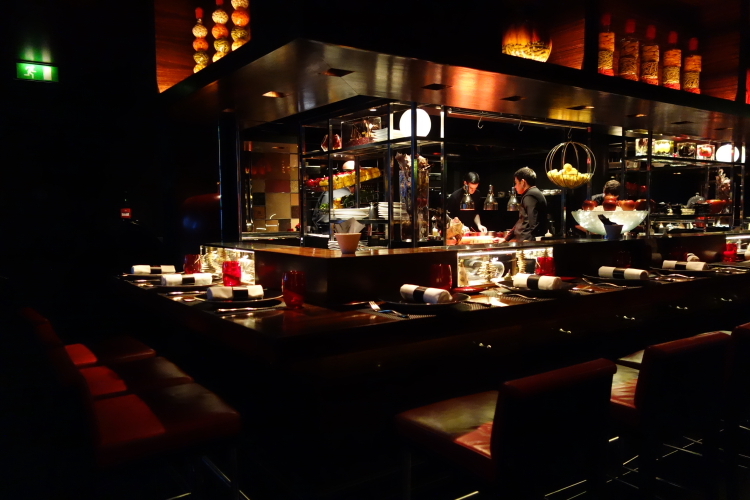 It also has a slightly more casual feel than other establishments at this level where some people feel the atmosphere can be slightly formal and even intimating. When I ate at Le Gavroche (Michel Roux Jnr’s) for example, you are told ‘gentlemen are requested to wear jackets at all times’! 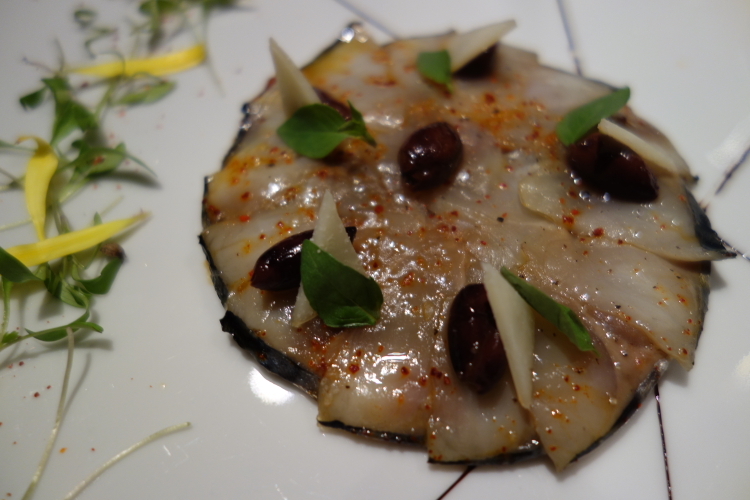 The most recent of these lunch deals I sampled is that at L’Atelier Joël Robuchon. Joël is the world’s most Michelin starred chef with more than 20 across 9 cities. Many follow the same outline, a central open kitchen with counter and a few tables around the side. This incarnation is no different in décor and acclaim, it held 2 stars when this review was published but was demoted to 1 in late 2013. I journeyed from Nottingham on a snowy day in February to St Pancras then Covent Garden where the restaurant is located on a quiet side street. On to this affordable lunch, the evening tasting menu at L’Atelier will set you back £129 but at lunch you can eat 3 courses for £35 or 4 for £40. We were seated at the counter and decided to chose the 4 course option with the addition of wine pairings at £59. Before the main event started we had an amuse bouche of foie gras with a port reduction with parmesan foam, the port cutting through the rich mousse. Proceedings began with a well crafted lobster dish accompanied by a guacamole with a hint of chilli. Classic, clean flavours. The course did carry a £7 supplement but was generous with the lobster. The next course was a real dichotomy between the most impressive and most disappointing dishes of the meal. I had chosen clams stuffed with pink garlic, which was perfectly ok except for the fact there were the sum total of 4 clams, frugal to say the least. My fellow diner however had a sublime mackerel tart which looked beautiful and showed off great technique to elevate a usually underrated fish. A main course was a duck breast, perfectly cooked, served with turnips and a rich, fruity jus. This, once again, had a supplement of £7 which I thought a little much for duck which I don’t see as a terrifically expensive meat. The other main was a veal belly dish which had the usual cardiac inducing, fatty deliciousness. This course is always served with an additional vegetables which on this occasion was a nice, but unexciting, few florets of cauliflower. For dessert we ventured to a well appointed room on the third floor which was a more comfortable space. 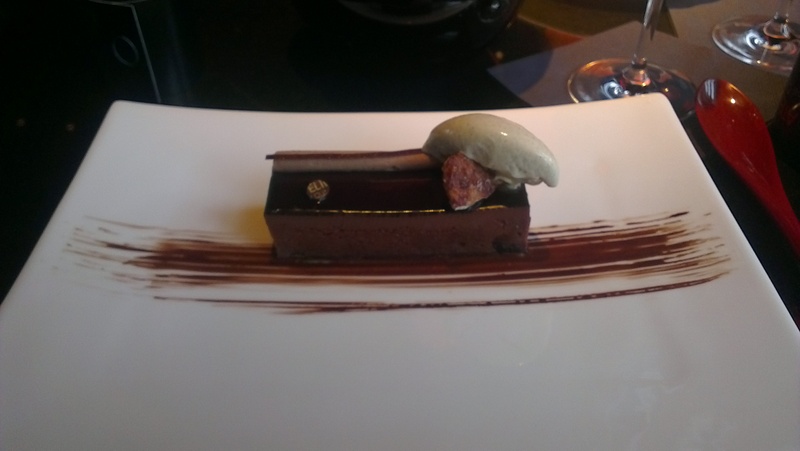 The final course was the best of the afternoon, stunningly presented ‘chocolate bar’ with strong cacao flavours and sweet pecan ice cream cutting through the richness. My friend had coffee 4 ways which showed off good technique. It didn’t quite have the wow factor of mine but was described by my culinary colleague as “a coffee lover’s comfort food”. Service, surprisingly, missed a few steps. There was a very short period between two of the courses and we did have to make requests twice on more than one occasion. Despite this, for the level of cooking on show L’Atelier is great value, especially for the heart of London.